"I am going to fabricate eggs." "Are you going to lay them yourself?" "No. I was thinking omelet. But first, I need Wolfgang's Requiem." Don't ask me why grating cheese and whisking eggs needed to be accompanied by the "Dies Irae" this morning. They just did, that's all. I have stopped trying to explain the Eloise or Olivia-like commands I get from my brain at times, finding it is easier to just obey them and get on with it. Toshie seemed to enjoy my rendition of the alto part, which I still remember from high school. At least I think that's what that adoring look meant. It couldn't have been the cheese I was grating, oh no. Not our dog. Perhaps we should blame Franklin for my sudden desire for choral funeral music with breakfast. I have been reading his archives and giggling and wishing he lived in Washington instead of Chicago. Franklin, if you ever read this, we have a fantastic yarn store in Bethesda that would treat you right, dearest. Just say the word and we will prepare the guest room. Or perhaps we should just blame Marie, who pointed me to Franklin's blog in the first place. Yoga class (teaching), Whole Foods (dairy products and coffee that has never been near the artificial hazelnut gack that inevitably gets into the grinders at the grocery store), and then home for a shower and off on a mammoth errand-run. The Rockville Pike is enough to turn Buddha himself into a serial killer, but the genius shoe repair guy and The Container Store are both located on this overcrowded strip of asphalt, so there was no avoiding it if I wanted my favorite black pumps repaired and a guaranteed source of decent travel bottles. Knowing this, I tried a different tack from my usual strategy which generally consists of, "throw my body into the teeming mass of humanity and end up a tense, frustrated, cursing ball of nerves." Instead, I took a deep breath, and sternly told myself that it was going to be a zoo, that I wasn't on a deadline, so just chill. Surprisingly, it worked. It also helped that the genius shoe repair guy and the clerk at The Container Store (Query: why do I always seem to go there when they're doing their semi-annual closet organizer sale? WHY?) were both intelligent and funny back at me when I was busy breathing and being determinedly (and probably goofily) cheerful about my squazillion errands. 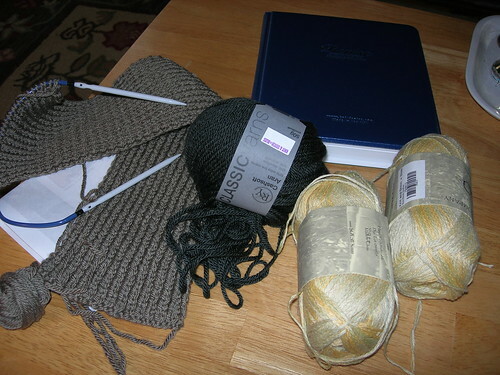 Yes, I really knit almost that entire skein of grey/brown yesterday evening. That yarn is so soft and springy and luscious that I want to bathe in it. We're actually going back for more today, so I can make my darling a hat as well. I may also buy some yarn to make something for me (shocking. I almost never make stuff for me). 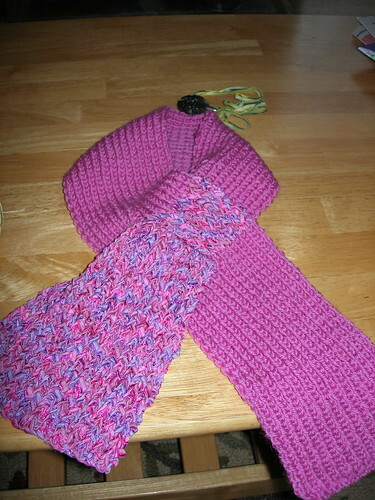 The hat was also made from leftover yarn (I didn't make the blanket quite as large as the pattern called for. Instead, to quote my friend Loretta, I "bound off and declared victory.") 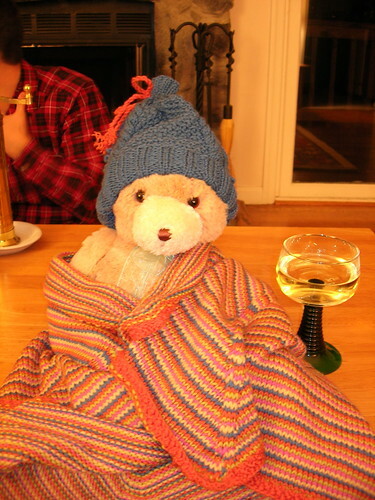 You can, of course, see why the bear needed a drink. That many colors will send anyone to seek solace in the bottom of a glass. It's raining. More yarn, please. My grandmother Erna was a sleight-of-hand artist. She may have been good: she was a fantastic cook, knitter, and seamstress, but I was also a credulous kid, so it is hard to tell in hindsight. She had one trick. She would rub her hands slowly together, seemingly devoid of artistry. When her hands opened, a wax-paper wrapped Squirrel Nut candy would be nestled in one palm. She did it rarely, and for a small child this was pure conjuring magic. Her talented, paper-dry hands would simply come together and friction and heat would create a lump of hard, almost impossibly chewy candy. Years later, when I was an adult, Gramie and I returned from a barefoot ramble around her garden. She grabbed the hose and rinsed off our feet, hers to mine, mine to hers. My feet... her feet. My feet were the same as her feet. We looked at each other's feet, then at our faces, then at our hands. Our hands were the same too. What was a muted but clear resemblance in other places was pure cloning in our hands and feet. I have my grandmother's hands. My hands don't produce candies. Their magic is muted, even though they can produce some other things the way my grandmother's could. I can rub my hands together, but no conjuring ensues. From yesterday's Wall Street Journal, a story guaranteed to rile Our Heroine right the heck up (no linkage, because the WSJ has a particularly restrictive website). The general thrust of the story was about people whose credit reports are getting dinged from overdue municipal fines sent to collection agencies. One enterprising gent whose mortgage rate was affected by overdue library fines was quoted. His kids (among them a 2-year-old) had failed to return library books in a timely manner, and the resulting fine and his failure to pay had affected his credit. His response? He has forbidden his kids to go to the library. Instead, they go to B&N which does not "retaliate. *" Yes, because when young children in your care and under your guidance don't return their borrowed library books on time, and you as the adult responsible (I use the term loosely) for their upbringing fail to pay the resulting late fees, the only obvious recourse is to forbid the use of this educational, civic institution. Should we even get into the issue of whether or not "retaliation" is the proper concept when we are talking about two organizations which differ in their basic model - one which lends you something for a predetermined period of time and after which has the basic right to charge you usage for failing to return it and one which exchanges the same something for cash up front? No, let's not. My poor head, she can't handle the exploding. *Pardon, I'm not sure if this is the exact term used - I'm working from memory here.